The weather on the morning of Sunday, 23-September, was just as predicted – absolutely lousy: rain showers with temps in the low 60’s and a north wind. It felt a bit raw for us. We donned our rain gear, untied from the mooring ball and got underway around 0930. 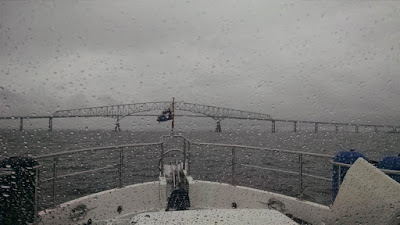 In spite of the poor weather the river and bay were packed with small sailing vessels and a fair number of power vessels, requiring a few detours from the planned route and an occasional evasive maneuver until we were north of the Bay Bridge. There were a few areas where we also had to dodge floating debris, not too surprising given the recent high tides and coastal flooding, but we managed to avoid the big stuff (including a very large truck tire…still mounted on its steel wheel rim…that was different.) The blah weather persisted all day, so we handled helm duties from the pilot house except for the two short spells on the fly bridge during the departure from the Annapolis mooring field (when Chelle got quite wet) and the arrival in Baltimore (when Rick did also). But We Could Not See It. 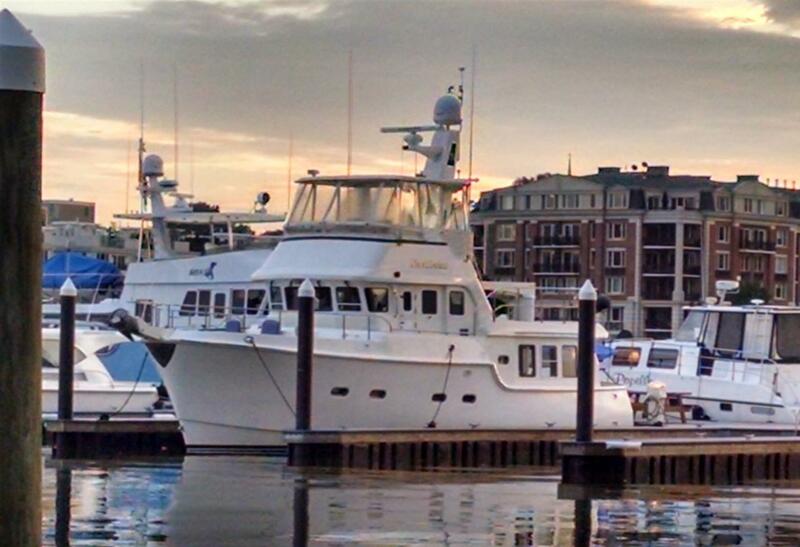 But it all went without any drama and by 1330 we were “tucked in” at a cozy slip at Harbor East Marina in Baltimore. Given the persistent rain we did not bother with giving Ghost Rider her needed wash down – that could wait until the next day. On Monday, 24-September we awoke to the same but expected dreary weather, and went about our business as usual, donning rain gear again and giving the boat and the dinghy their much-needed soapy baths. After topping off the water tanks we also retrieved numerous packages from the marina office that had been delivered over the past two weeks as part of our periodic re-provisioning / re-supply process. By early afternoon we were done with boat business and ready to get into town. For the most part the rain was intermittent and light, so it was fairly tolerable if a bit damp. Rick found a barber shop to get a long overdue haircut and to run a few other errands while Chelle grabbed a few groceries at the local Whole Foods store. Next up was the main reason we had come to Baltimore in the first place. Some of the attractions of the Trawler Fest event are the courses that are offered. On Tuesday, 25-September, and Wednesday, 26-September, Rick attended the two day “Diesel Seminar”. While that would have been a better idea two or three years ago, it was still quite a valuable educational experience. 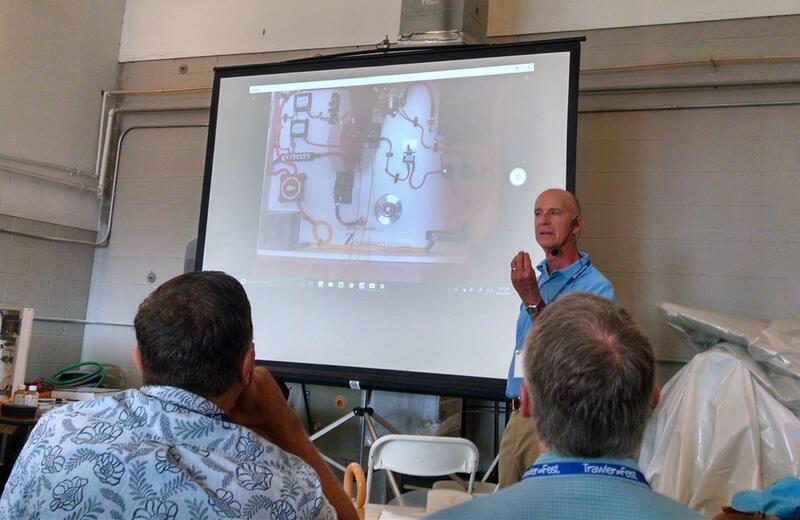 Taught by a pair of recognized industry experts – Nigel Calder and Steve Zimmerman – the two days are loaded with useful information, from theory of diesel architecture and operations, to practical hands-on maintenance experiences. A considerable amount of time was spent on electrical systems and troubleshooting, not just the mechanicals, as that tends to be the focal point in real world diesel engine fault resolution. Tuesday evening was a fun social night for us. Our friend and trusted broker, Jeff Merrill, was in town to partake in the Trawler Fest in-the-water boat show, so we joined him, his wife Pam, and owners of the Nordhavn 47, NaviGator, Mike and Patsy, for the evening. 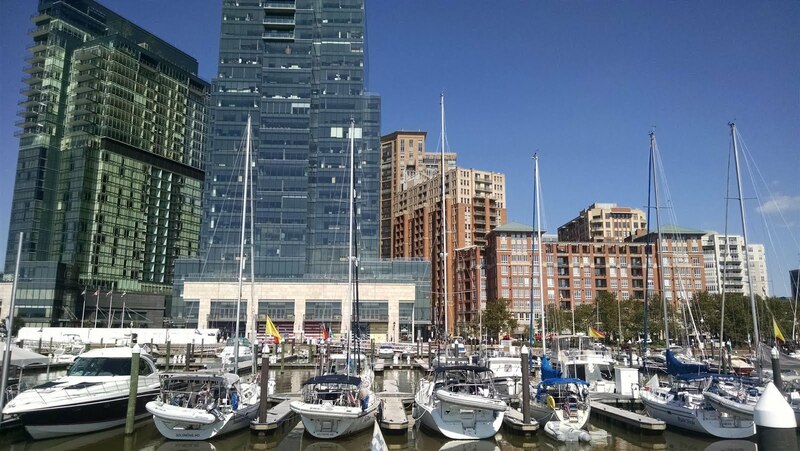 We started with a happy hour aboard Ghost Rider, migrated to nearby Taco Fiesta for a casual dinner, and then concluded with a tour of NaviGator back at Harbor East Marina. 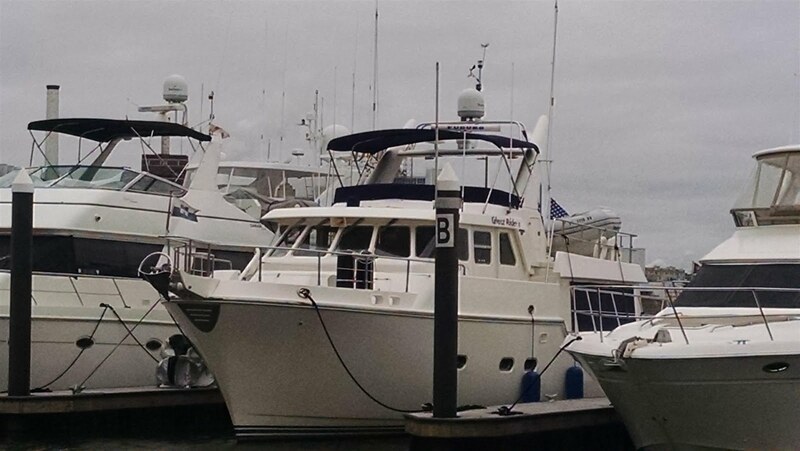 On Wednesday Chelle attended the “Admirals Round Table” session at Trawler Fest – it was rather entry-level based on her cruising experience but nonetheless she still picked up a couple of tips. By that evening we were both already worn out and we called it an early night. 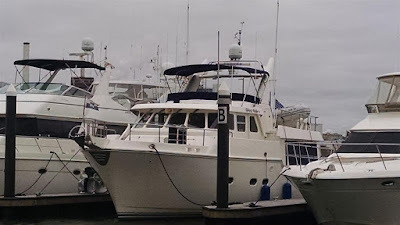 In spite of the rainy gloom we enjoyed another fun social evening, this time with Charlie & Missy Hodge (who live nearby and own the Nordhavn 50, Ophelia) and Michael & Tracy Woodring (who were at another nearby marina with their Nordhavn 46, Chicory) . We had a relaxing happy hour aboard Ghost Rider and then walked to one of Charlie’s favorite nearby restaurants, Ouza Bay. Rick had the Spiced Cobia (fantastic) and Chelle enjoyed a very tasty (and pricey) filet mignon. Charlie had picked a great spot and we highly recommend this place. The weather finally broke the morning of Friday, 29-September, dawning a little cool but mostly clear with light winds. It was a most welcome change. We had arranged for a diver nearly a week ago as we were well overdue for bottom and running gear inspection and cleaning. “Dave the Diver” showed up right on time at 0830 and got to work – it was bottom cleaning by braille, as the local waters were loaded with sediment and muddy runoff from all the recent rains, allowing underwater visibility of only six inches. A short time later our good friend Jeff Merrill visited us again aboard Ghost Rider, this time carrying his bags of camera gear. We were due to change out one of the main engine’s Racor fuel filters and Jeff has asked if he could video that procedure to use as one of the (many) training and “how-to” clips. Chelle helped him with setting up the gear and manned the camera, which probably took longer than Rick needed to actually change the filter, but it all seemed to go well. That afternoon we attended our last Trawler Fest seminar of the week, this time a two hour “round table” session with a panel of noted industry experts, including Jeff, but also: Bruce Kessler (who practically invented voyaging in power boats, and has logged more ocean miles than nearly anyone on the planet, including circumnavigations); Steve Zimmerman (boat yard guru and cruiser); Eric Kunz (Furuno’s head tech and an experienced cruiser); Chris Parker (noted weather router and experienced cruiser); plus several other highly experienced experts, who also had logged many miles at sea. It was a fun and instructional Q&A forum. 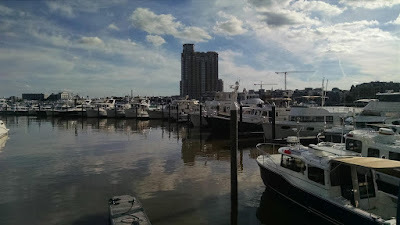 We concluded the day with a brief walk down the Trawler Fest dock where all the “for sale” boats were moored; we got some ideas of which boats we would spend more time on the next day, but mostly just enjoyed the warm late afternoon sunshine and pleasantly warm breeze. Saturday, 29-September, was another gorgeous morning, with mid-morning temps in the low 70’s, low humidity, light winds and sunny skies. We had slept in a bit and then spent some time mission planning our routes for the coming week and loading those into the ship’s navigation equipment. After Chelle made a brief provisioning run to the Harris Teeter grocery store (via e-bike) we headed into town to shop for some stainless steel hardware. 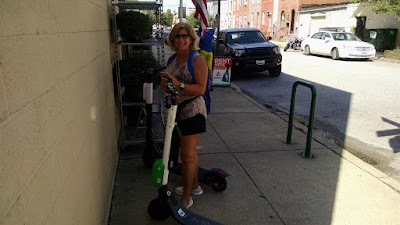 Basically the things are electric skateboards with a handlebar-mounted throttle and brake controls, and after using a smartphone app to unlock and pay a nominal fee, you can buzz along at about 15 MPH anywhere in the city. Riding on sidewalks, bike paths and streets are all allowed, although that’s part of the controversy. 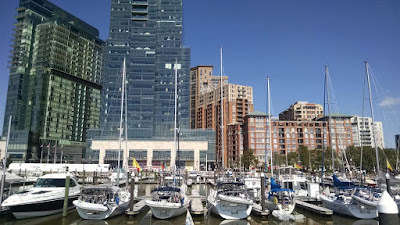 But we got to and from the hardware store rather quickly and took a tour of the Baltimore harbor waterfront on the way back to the boat. Our take on them is that the suspension is awful going over cobblestones, but they are a fun and quick way to get around....and could be dangerous if reasonable caution is not exercised around pedestrians and automobile traffic. Once we returned to the marina and implemented the quick wiper arm repair we headed over to the adjacent docks to view some of the Trawler Fest vessels. We toured a couple that seemed interesting, but mostly just out of mild curiosity, and perhaps with an eye to the future and the “next boat” – once we were done with trawler voyaging. We also stopped by N47 NaviGator to say “hi and bye” to Jeff, Mike and Patsy, since we would be departing the next morning. That evening we hosted a tour of our own onboard Ghost Rider when we came across a young(er) couple who wanted to tour a Nordhavn 50 – apparently they had decided this was the trawler model they wanted when they retired and were focused on finding one. That’s not an easy task as there aren’t that many in total, and currently none are on the market. But we enjoyed answering their questions and apparently confirming their choice of vessel. After that we completed our final departure preparations….engine room and lazarette pre-flights, emptying the trash, filling the water tanks, removing the covers from the pilot house windows, stowing the water hose and Chelle’s e-bike, and sending out our standard float plan email. We were looking forward to the next morning and departing Baltimore.